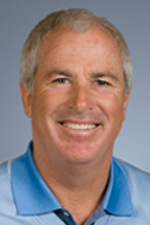 Curtis Strange was able to conquer the very difficult Oak Hill Country Club East Course in suburban Rochester, N.Y. the final day with an even par round to hold off a trio of players by one shot for his second consecutive Open. The previous year at The Country Club in Brookline, Mass. he had decisively beaten Nick Faldo in an 18-hold playoff by four shots. Ben Hogan in 1951 was the last to win two in a row and since Strange’s accomplishment no one has been able to do it. The even par 70 Strange was able to post that June Sunday allowed him to catch and surpass third round leader Tom Kite who had a day he would just as soon forget. Kite’s downfall started with a tee shot in the water resulting in a 7 on the par-4 fifth hole and he finally finished with a score of eight over par 78. Kite had lead going in to the final day by one shot over Scott Simpson and by three over Strange. Strange’s fourth round was the model of consistency with pars on the first 15 holes and finishing with a go ahead birdie on 16, a steady par on 17 and a careful three putt bogey to protect his lead on 18. He finished one stroke ahead of Chip Beck, Mark McCumber and Ian Woosnam. So, on the eve of the 2012 Open, last year’s winner Rory McIlroy has his work cut out for him and the odds aren’t in his favor. Jack Nicklaus never won two in arrow, nor did Tom Watson or Arnold Palmer, not even Tiger Woods.